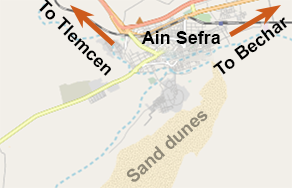 Ain Sefra (also spelled as Aïn Séfra or عين الصفراء in Arabic) is a small city of 35000 inhabitants. It is located roughly half-way between Bechar and Tlemcen, at the border to the Sahara desert, at an altitude of 1000m. Here is where Isabelle Eberhardt, the 19th century Swiss explorer, died in a flash flood in 1904. In Aïn Séfra there is not too much to see, but the sand dunes south of the city are nice and worth exploring for a few hours. From Bechar it takes a bit over three hours to reach Ain Sefra by car, driving on a good, motorway-like road. From Tlemcen it takes hour hours by car to reach Ain Sefra. There is also a train station with trains to Oran (six hours). There is just one hotel in Ain Sefra - Hotel Mekther (phone +213 49 76 14 17).